The matching assessment type is quick and easy to set up. This assessment type is best used for assessing shallow level knowledge. To author your assessment type, first determine what your question or task will be. Insert this information into the Question --> Content box, seen below. This box works just like any other spoken / display text box. 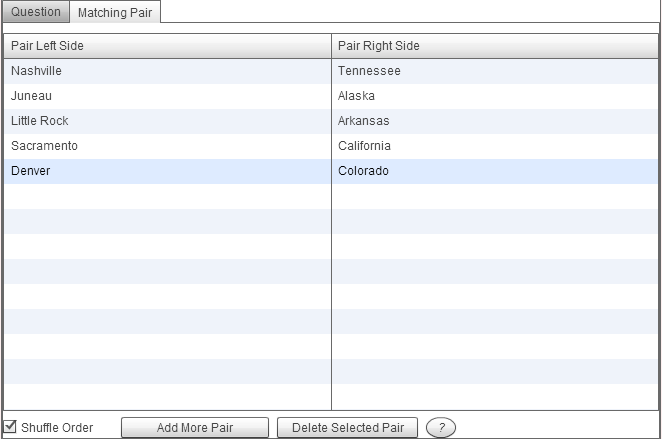 After you have determined your question, click on the "Matching Pair" tab. Click on the "add more pair" button to add another match item. Here, the left and right items should be matched. By clicking on the "shuffle order" button, these pairs will be randomly shuffled for your student during the assessment portion.